Shoreline Area News: Shoreline residents - would you like to learn more about your City? Shoreline residents - would you like to learn more about your City? Would you like to learn more about your City? 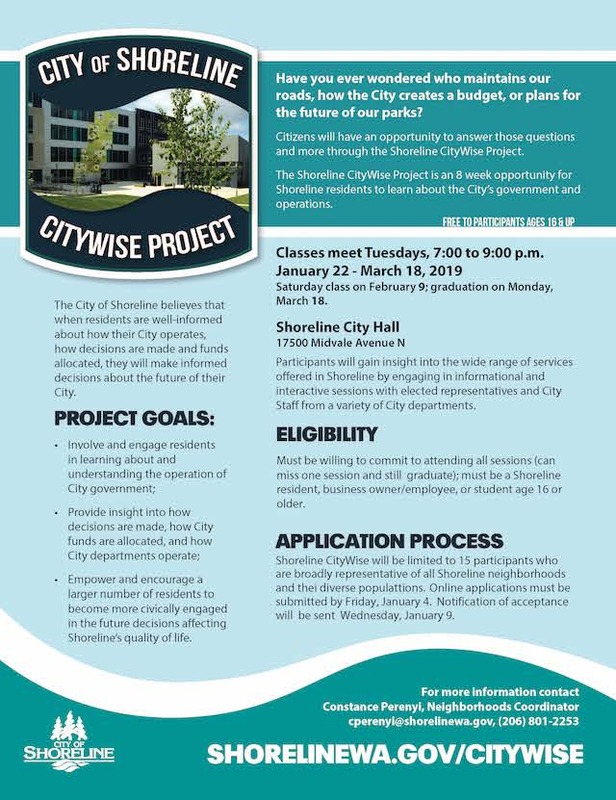 Curious residents will have an opportunity to learn how local government works in the third Shoreline CityWise Project, a series of eight interactive classes starting in January 2019. This series is free of charge, and open to residents, employees, business owners, and students ages 16 and older in Shoreline. Class size is limited to 15 participants who represent the City’s different neighborhoods and diverse populations. Interested people must submit a completed online application by Friday, January 4. Notification of acceptance will be sent the following week, and classes begin on January 22. For more information, contact Neighborhoods Coordinator Constance Perenyi at 206-801-2253 or email.